Ray fungus is the common name for a group of organisms called actinomycetes. 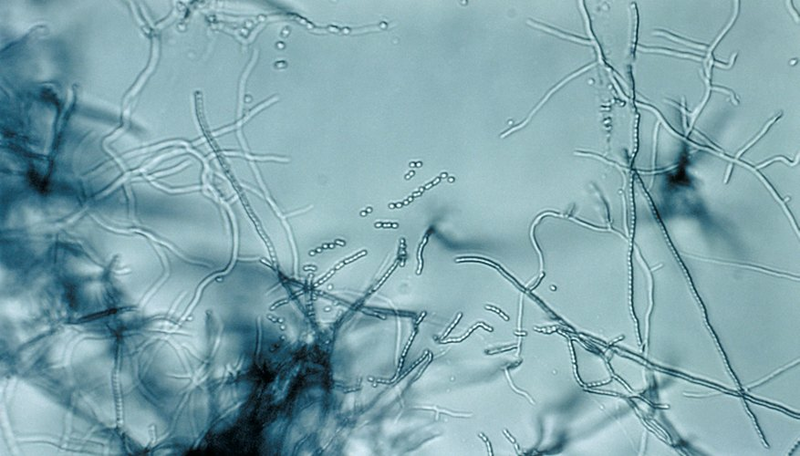 Actinomycetes have characteristics of both fungi--superficially--and bacteria. Some think they deserve their own category of classification, but most researchers agree they belong with the bacteria. Ray fungi are prokaryotes, meaning their genetic material floats freely in the cell, not enclosed in a nucleus. Prokaryote cells are smaller and simpler than eukaryote cells. The cells are rod-like or filamentous and branching, fostering the confusion with fungi. Ray fungi are in soil all over the world. Species of the genus Streptomyces give the "fresh dirt" smell after a rain. Actinomycetes are part of the normal flora in the human mouth. Normally they are harmless unless a patient has a compromised immune system. Actinomycetes produce many antibiotic compounds including streptomycin, actinomycin and chloromycin. Adriamycin is used in cancer treatment, and rapamycin is used for immunosuppression before organ transplant. Infections by actinomycetes--actinomycosis--rarely occur in the mouth and jaw after dental surgery. Infections may result from a puncture wound or from breathing cells. Since actinomycetes are prokaryotes, antibiotics are usually effective.